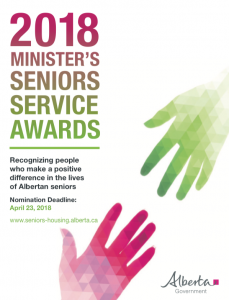 Nominate an exceptional volunteer who helps brighten the lives of seniors, for a 2018 Minister’s Seniors Service Award. Across the province, dedicated volunteers complete tax returns, teach computer skills and make hearty breakfasts for hundreds – helping seniors in countless ways. Nominees will be recognized at community celebrations to be held across Alberta during the summer. The Minister will select up to eight award recipients to be honoured at a special ceremony in the fall of 2018.